The lungs, which is the organ for respiration is a paired cone shaped organs lying in the thoracic cavity separated from each other by the heart and other structures in the mediastinum. Each lung has a base resting on the diaphragm and an apex extending superiorly to a point approximately 2.5 cm superior to the clavicle. It also has a medial surface and with three borders- anterior, posterior and inferior. The broad coastal surface of the lungs is pressed against the rib cage, while the smaller mediastinal surface faces medially. The lungs receives the bronchus, blood vessels, lymphatic vessels and nerves through a slit in the mediastinal surface called the helium, and the structures entering the helium constitutes the lungs root. The right lung is larger and weighs more than the left lung. Since the heart tilts to the left, the left lung is smaller than the right and has an indentation called the cardiac impression to accommodate the heart. This indentation shapes the inferior and anterior parts of the superior lobe into a thin tongue-like process called the lingual. 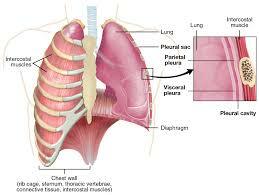 Each lung is invested by and enclosed in a serous pleural sac that consists of two continuous membranes. The parietal pleura line the pulmonary cavities and adhere to the thoracic wall, mediastinum and diaphragm. The parietal pleura consist of four parts: coastal pleura which lines the internal surface of the thoracic wall, mediastinal pleura which lines the lateral aspect of the mediastinum, diaphragmatic pleura which lines the superior surface of the diaphragm on each side of the mediastinum, cervical pleura extends through the superior thoracic aperture into the root of the neck, forming a cup-shaped dome over the apex of the lung. The pleural cavity is the potential space between the visceral and parietal layers of the pleural and it contains a capillary layer of serous pleural fluid which lubricates the pleural surfaces and allows the layers to slide smoothly over each other during respiration. Surface tension created by the pleural cavity provides the cohesion that keeps the lung surface in contact with the thoracic wall. Each lung is divided into lobes by fissures. Both lungs have oblique fissure and the right is further divided by a transverse fissure. The oblique fissure in the left lung separates the superior and the inferior lobe. The oblique and horizontal fissure divides the lungs into superior, middle and inferior lobes. Thus the right lung has three lobes while the left has two. Each lobe is supplied by a lobar bronchus. The lobes are subdivided by bronchopulmonary segments which are supplied by the segmental bronchi. 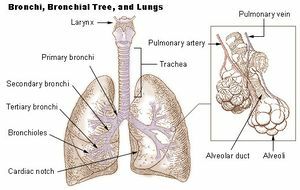 All the respiratory passages from the trachea to the respiratory bronchioles are called the tracheobronchial tree. The trachea divides at the sternal angle into right and left primary bronchus which goes into the right and left lungs. Each bronchus enters the lung at a notch called the hilum. Blood vessels and nerves also connect with the lungs here and together with the bronchus forms a region called the root of the lungs. The right main bronchus is larger in diameter and more vertical making it directly in line with the trachea than the left main bronchus. Thus swallowed objects that accidentally enter the lower respiratory tract are most likely to become lodged in the right main bronchus. The main bronchi divide into lobar or secondary bronchi within each lung. Two lobar bronchi exist in the left lung, and three exist in the right lung. The lobar bronchi, in turn give rise to segmental or tertiary bronchi. The tertiary bronchi supply the bronchopulmonary segments. 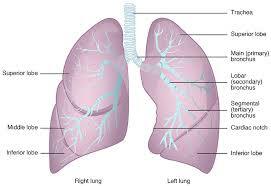 Functionally, the lung is divided into a series of bronchopulmonary segments. The bronchopulmonary segments are the largest subdivision of a lobe. They are separated from adjacent segments by connective tissue septa and are also surgically resectable. They are 10 bronchopulmonary segments in the left lung and 8-10 in the left lung. The bronchi further divides, finally giving rise to the bronchioles which are less than 1mm in diameter. Each bronchioles divides into 50 to 80 terminal bronchioles, the final branches of respiratory bronchioles. The functional unit of the lungs which is the acinus includes the respiratory bronchioles, alveolar ducts, and sacs and the alveolar. Approximately 16 generations of branching occur from the trachea to the terminal bronchioles. As the air passageways of the lungs become smaller, the structure of their walls changes. The major airways from the trachea through the ten generations of bronchi have descending amounts of cartilaginous support surrounded by smooth muscles and elastic fibres, they have goblet cells for mucus production and are lined with ciliated columnar epithelium to facilitate secretion clearance. The next five generation of bronchioles have no cartilage or goblet cells, but still have elastic tissue and smooth muscle fibres. They lined with ciliated cuboidal epithelium. Relaxation and contraction of the smooth muscles of the bronchi and bronchioles can change the diameter of the air passageways and so change the volume of air moving through them. The alveoli provide a large surface area for gas exchange. The alveolar walls consist of simple squamous epithelium. Also the tissues surrounding the alveoli contain elastic fibres which allow the alveoli to expand during inspiration and recoil during expiration. The epithelium of the respiratory zone is not ciliated but debris from the air can be removed by macrophages that move over the surface of the cells. Approximately 300 million alveoli are in the lungs. The average diameter of the alveoli is approximately 250um and their walls are extremely thin. There are two types of cells in the alveoli: type I pneumocytes which are thin squamous epithelia cells that forms 90% of the alveoli surface. Most of the gas exchange take place between these cells. Type II pneumocytes are round secretory that produce surfactant, which makes it easier for the alveoli to expand during inspiration. The bronchial arteries arising from the aorta provide blood supply to the non-respiratory airways, pleura, and connective tissue while the pulmonary arteries supply the respiratory units (acini) and participate in gas exchange. Venous drainage is mainly by the pulmonary veins (right and left superior and inferior pulmonary veins), though the venous of drainage from the walls of the larger bronchi is carried out by the bronchial veins. All four veins (pulmonary veins) drain into the left atrium. The lungs and airways are innervated by the branches of sympathetic trunk and vagus nerve. Sympathetic nervous stimulation results in bronchodilation and slight vasoconstriction, while parasympathetic nervous system stimulation results in bronchoconstriction and indirect vasodilation. The function of the lungs is controlled through the respiratory centre with groups of neurons located at the pons and the medulla oblongata, and complex interactions of specialized peripheral central chemoreceptors. Auscultation of the lungs and percussion of the thorax are important techniques used during physical examination. Auscultation assesses airflow through the tracheobronchial tree into the lungs. Percussion helps establish whether the underlining tissues are air filled (resonant sound), fluid filled (dull sound) or solid (flat sound). Based on the anatomy of the bronchial tree, gravity can be used to assist the clearance of bronchial secretions through the use of positioning. Also Bronchial disorders such as tumour and abscesses may be localized in a bronchopulmonary segments and may be surgically removed without disrupting the surrounding lung tissue. Nasal mucosa and hairs: warm and humidify inhaled air and filter out particle. Goblet cell and bronchial seromucous glands: produce mucous which contain immunoglobulin A, cytokines, and other cytolytic substances, with extensive mucosal production of nitric oxide by the nose and paranasal sinuses; all of these have potent antimicrobial activity, to protect underlining tissues and trap organisms and particles. Bacteria are destroyed by lysozyme in the mucus. Also additional protection against bacteria is contributed by lymphocytes which populate the lamina propria in large numbers. The lamina propria contain large blood vessels that help to warm the air. Furthermore, the inferior concha has an especially large venous plexus called the erectile tissue. Every 30 to 60 minutes, the erectile tissue on one side becomes engorged and restricts air flow through that fossa, causing air to be redirected through the other nostrils and fossa thus allowing the engorged side to time to recover from drying. The flow of air shifts between the right and the left nostrils once or twice each hour. Mucous production is increased by inflammation (e.g. in conditions like asthma and bronchitis) and its composition can be altered by diseases. Cilia: structures move nucleus up the carina and the throat through mucocilliary transport. Mucocilliary transport is impaired by inhalation of toxic gases (e,g cigarete smoke and air pollution), acute inflammation, infection, anaesthesia, etc. Type II pneumocytes: produces surfactant which protects underlining tissue and repairs damaged alveoli epithelium. Alveoli macrophages: engulfs foreign matter and bacteria. Their activity can be hindered by cigeret smoke, air pollution, alveolar hypoxia, radiation, corticosteroid therapy, and ingestion of alcohol. B lymphocytes: produce gamma globulin for the production of antibodies to resist infections. Polymorphonuclear leukocytes engulf and kill blood borne gram negative organisms. ↑ 2.0 2.1 2.2 2.3 2.4 2.5 2.6 Drake, RL, Vogl, W, Mitchell, AW, Gray, H. Gray's anatomy for Students 2nd ed. Philadelphia : Churchill Livingstone/Elsevier, 2010. ↑ Gaga, M, Viginola, AM, Chanez, P. Upper and lower airways: similarities and differences. European Respiratory Journal. 2001; 18: 1-15.